Doing final organization for my Trumpeter Salute Russian Civil War game this evening, I did something I’ve never actually done in the two years of this project — laid out every single painted, game-ready RCW figure and model I have together. The lighting in my dining room is awful, so this is a terrible photo, but it’s fun to see everything laid out for review! Whites on the left, Bolsheviks on the right. See text for more details, and click for larger. On the left, the White Russians. Officers and machine gun in front, two dozen Cossack riflemen, then a couple more officers, then 32 rifles from a regular rifle regiment. All of my White Russian figures are from Brigade Games. In the centre, the 77mm field gun (nominally Red), sixteen cavalry, one armoured car, and one protected railcar. These figures are (so far, at least) all deliberately painted without much in the way of identifying insignia, so they can and have appeared for both sides in our games. On the right, the Bolsheviks. Officers, machine gun and banners in front, and the long column is forty ordinary Red riflemen. Far right is twenty Red Sailors and their leaders, and behind them is the Red militia of 15 rifles. The Bolsheviks all happen to be from Copplestone. This gives me a total of 56 White rifles, 75 Bolshevik rifles, and a grand total figure count (including gun crews) of exactly 190 figures, apparently. I’ll tick over 200 fairly soon, as there’s another round of White rifles to paint up. That’ll pretty much finish off the regular infantry, although I do want another section or two of Red sailors. After that it’s off to more of the toys and quirky bits, tchankas, armoured cars and such! A quick late night post to alert faithful readers to two short-duration sales of possible interest. Secondly, in honour of the American Memorial Day weekend, Brigade Games, maker of (among a huge list of other things!) excellent Russian Civil War 28mm figures, have a deal until the 28th May: orders over $30 US can get a 10% discount by plugging the code “HONOR” (note American spelling…) in while you’re completing your transaction. I won’t be personally taking advantage of this one, but if you’ve been thinking of a new RCW force, or something else from that huge list of good stuff Brigade sells, now might be a good time! Speaking of Brigade, I badly need to finish the long review article I’ve got on their Storm in the East RCW/WW1 Eastern Front figures. You’ve seen them here as my White Russian forces, but they’re nowhere near as well known as Copplestone’s famous Back of Beyond range. There are some very nice figures in the Brigade range, though, as nice as anything Copplestone put out, and they fit together beautifully on the tabletop. I’ll make time early next week to put the finishing touches on that writeup and get it published here. Have an excellent weekend, no matter what your excuse for a party is! I’ve long been a fan of putting figures on the smallest bases they’ll fit on and that’ll keep them upright, when you’re doing individual bases for skirmish gaming. Almost all of my 28mm pulp and historical figures are based on Canadian pennies, which are about 18mm across. You can’t beat the cost, they’re big enough for nearly any human-sized figure provided you don’t mind the occasional toe or heel sticking over the edge a few millimetres, and the small size makes it far, far easier to get your figures into scenery, especially buildings and larger vehicles like ships. “Whatever happens, we have got/the Lewis gun, and they do not” — with apologies to Mr. Kipling, of course. My LPL5 Week 7 entry was more Brigade 28mm British, this time a Lewis gun team and supporting riflemen. 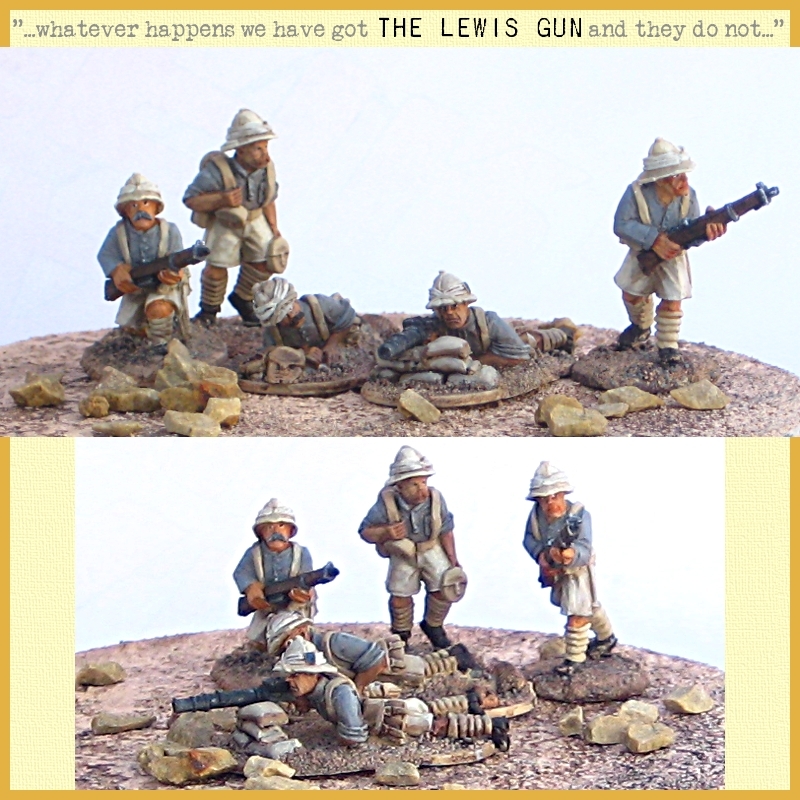 The Lewis gun team are very nice sculpts, slightly more detailed than the riflemen from the same range. They got matched up with a rather nice set of pirates, including a great pirate ghost, and defeated, though. The Lewis Gun, my Round 7 LPL5 entry. As always, click for full size. LPL5 Week 8 is on now! LPL5 Week 6: White Russians! No, not the (very tasty!) drink, but White Russian Rifles from sometime in the Russian Civil War; the figures are 28mm from Brigade Games and very nice. White Russian Rifles, my Round 6 entry for LPL5. As always, click for full size. My Whites will, by the time you read this, have been fairly comprehensively beaten by an Irish medievel/Dark Ages warband with very, very nicely painted freehand shield designs, and Round Seven will be underway! A bit quieter around the Warbard right now; I’m having most of my gaming time sucked up by the Lead Painters League 5 and real life; Corey is however away for the weekend at the Dak-Kon convention up-Island and promises lots of photographs upon his return. He’ll probably be doing a run of Amulet of Fire at some point over the weekend, too. 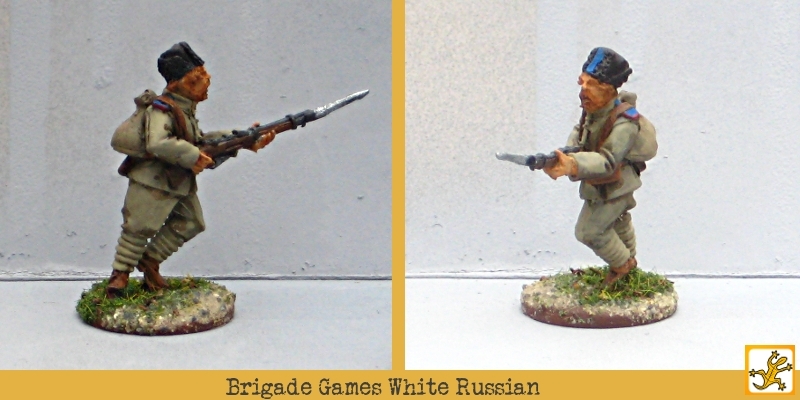 A Brigade Games White Russian rifleman in fur hat, first of a unit. Click for full size. 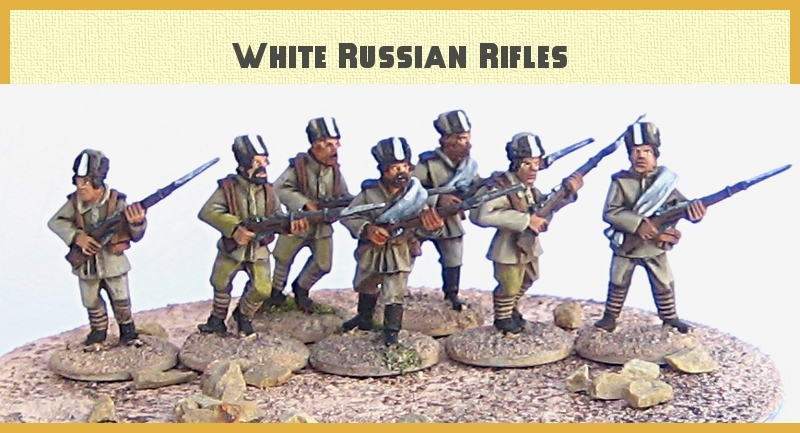 I’ve been painting various things, most of which I’ll wait for the various rounds of LPL5 to reveal, but here’s one of my new projects – a small foray into the Russian Civil War with a unit of White Russian riflemen, figures from Brigade Games, paint scheme not completely historic but based on inspiration from the Osprey White Armies book and some of the great resources shared on LAF’s Back of Beyond forum. Expect to see five or six of his squadmates in a future LPL5 round! Minor update, a few hours later: I posted this photo to LAF’s Back of Beyond forum and asked for feedback, and got some excellent advice from some of the local experts. I especially like the fact that Russian troops often had coloured cloth inner parts on their fur hats; this was news to me and it’s a chance to make them more colourful yet!